about what I'm trying to do right now. I don't know about anyone else, but I have some brand new stamps that I haven't had a chance to use yet. So I'm going to try and use some of my new images for projects over the next couple of months. I don't know how much I'll be able to do but I'm going to try LOL! I didn't get to spend as much time in my craft room as I wanted today but I did manage to finish one card. For this card I used a stamp I got about a month ago called Drucilla from Kraftin Kimmie Stamps. I stamped the image on Gina K 120lb base weight paper and colored it with copic markers (E000, 00, 01, 21, 25, 27 - R20, 22, 24, 27, 29 - YG 91, 93, 95 - N0, 1, 3, 5, 7 - 110, 0 and black multiliner). I also added some shimmer with a red star, silver star & sakura clear stardust pens. I'm happy with the coloring but not with how I cut it out. I didn't want to waste all that work so I decided to make a card with it anyway. The patterned paper is from the My Mind's Eye Meadow Lark line and I edged it with barn door distress ink. 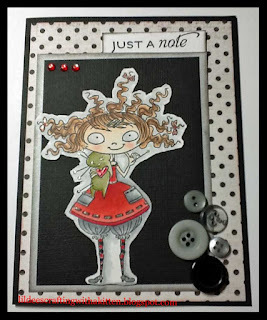 I added some buttons and rhinestones (colored with R29) as decoration and the greeting is from the tag lines stamp set by Flourishes. Well that's it for tonight, have a great weekend everyone.